We get to see all kinds of games on app marketplaces like the Google Play Store and the iStore. Games, for most users, are limited to action games, racing, strategy, and puzzles. There are some, however, that offer unique gameplay as well as graphics. One of these games is Geometry Dash. It is a game that has gathered popularity gradually after it was released in 2013 by Robert Topala via his company RobTop Games. Geometry Dash is running game with a rhythmic music playing in the background where the users have to save a block from all kinds of obstacles. It has many features that we will talk about but let us first get to the gameplay. Like many simple running games, this game involves a tapping/clicking system to jump over obstacles, depending on what device the user is using to play the game. On a smartphone, tapping has to be employed, but while playing on a computer screen, a mouse click is required to play the game. The accompanying music that changes from level to level is also a key feature in the game the speed of the block is in relation to the music. The music is also different on each level in the game. A disappointing feature and often times annoying is that there is no ‘Last Saved’ option. A user has to restart from the very beginning if the block explodes upon colliding with an obstacle. The first three levels of the game are automatically unlocked and with the progress of the game; the other levels go on unlocking. Secret coins are also placed at strategic places for users to collect and used later on for special powers. The coins are, however, very difficult to gain as they are placed in very challenging places. The game becomes challenging later on as the icon changes its shape six different times in 6 different portals. The portals are also challenging with some becoming mirror portals while there is a gravity portal as well as an anti-gravity portal. There are also four speed portals that change the speed of the icon drastically. There are 20 different levels that the game can be played in, and there are 3 secret coins for every level which makes it 60 in total. 17 out of the 20 levels unlock from the very beginning, and the rest of the three levels unlock depending on the coins gathered. 10 coins unlock level 18 which is called Clubstep, 20 coins unlock the Theory of Everything 2 which is level number 19, and the last level is unlocked by 30 coins which is called Deadlocked. The levels are easy to start with minimalistic obstacles and a simple background but with progress in the game difficult obstacles are confronted. The difficulty that the game is played in also varies from Easy to Demon. Also, if a user has coins to spare, then he/she could go ahead and create their own level. A restriction is also provided in the form that the user has to beat his own creation for others to access the level and play it. Well, you are now aware of how the game is played and what you need to do in order to complete the game, so let us know take out the features. 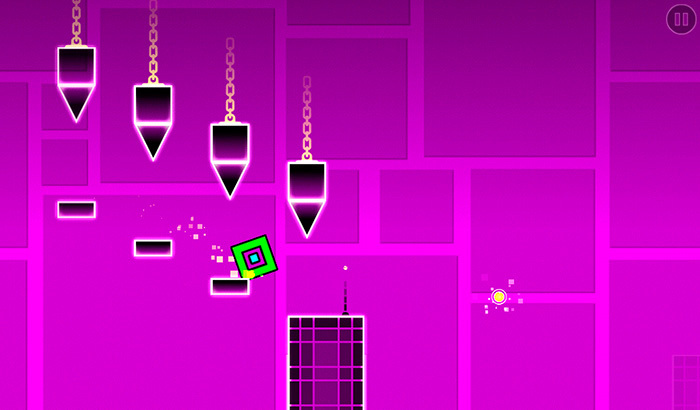 Geometry Dash comes with a rhythm-based action platform for users to coordinate their eyes and fingers with their ears. Each different level has a different soundtrack. With the level editor, any player can create their own levels and share it with others. With game progress and coins, users can unlock new icons to customize their character. There is a practice mode that users can utilize to practice before launching into the real game. There are lots of achievements and rewards to be collected. The game comes absolutely free of cost and also does not have any in-app purchases. How to get Geometry Dash on your Android device? If you are interested in getting the game after reading through the description, then let me tell you that it is really simple to download and install this game on your Android device. You just need to visit the Google Play Store from your device and then search for Geometry Dash. As soon as the app appears on the top of the search list, you just have to download it, read through the permissions and then install it. Using this simple method, you can get this game and also play easily. You can directly get the game here.